Abhishek Bachchan was born on 5th Febuary 1976 to Bollywood Legend and Veteran Actor Amitabh Bachchan and Bollywood actress Jaya Bachchan. Abhishek Bachchan has done his high school in Switzerland. While doing business studies in the United States he had decided to become an actor. He started his acting career from film Refugee opposite Kareena Kapoor. It was not a hit but his performance was to the expectations and noticed by critics also. In LoC he plays the role of Captain Vikram Batra which is a worthwhile experience for him. Mumbai Se Aaya Mera Dost film failed to create any ripples but still Abhishek stands by it. Critics said the film needed improvement in the scripting department. But his role in the film is appreciated. He had done many films but still he is struggling hard for a blockbuster which can prove him. Despite all this he had been through with the Kapoors. He was engaged to Karishma Kapoor in 2002 but after few months they had broke up. Abhishek forthcoming film is Yashraj film venture directing by Sanjay Gandhavi. Uday Chopra and John Abraham are the other star in it. Ram Gopal verma's Naach. His home production film with Apoorva Lakhia which is untitled. And their is one more film with Rajkumar Santoshi Zakhm in which for the first time father and son 'Big B' and 'Junior B' working together. This will be definitely the most exciting happening of the year. 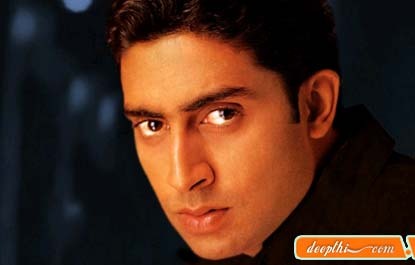 Bluffmaster ( Abhishek Bachchan, Priyanka Chopra, Ritesh Deshmukh), Sarkar ( Amitabh Bachchan, Abhishek Bachchan, Kay Kay, Katrina Kaif), Dus ( Sanjay Dutt, Sunil Shetty, Shilpa Shetty, Abhishek Bachchan, Zayed Khan, Esha Deol), Bunty Aur Babli ( Abhishek Bachchan, Rani Mukherjee, Amitabh Bachchan), Naach ( Abhishek Bachchan, Antara Mali, Ritesh Deshmukh), Dhoom ( Abhishek Bachchan, John Abraham, Uday Chopra, Rimi Sen, Esha Deol), Phir Milenge ( Salman Khan, Shilpa Shetty, Abhishek Bachchan), Run ( Abhishek Bachchan, Bhumika Chawla, Mahesh Manjrekar), Yuva ( Ajay Devgan, Abhishek Bachchan, Vivek Oberoi, Rani Mukherjee, Esha Deol, Kareena Kapoor), LoC Kargil ( Abhishek Bachchan, Ajay Devgan, Akshaye Khanna, Sanjay Dutt, Saif Ali Khan, Sunil Shetty, Manoj Bajpai, Sanjay Kapoor), Zameen ( Ajay Devgan, Abhishek Bachchan), Mumbai Se Aaya Mera Dost ( Abhishek Bachchan, Lara Dutta), Kuch Naa Kaho ( Abhishek Bachchan, Aishwarya Rai), Main Prem Ki Diwani Hoon ( Kareena Kapoor, Hrithik Roshan, Abhishek Bachchan), Om Jai Jagdish ( Anil Kapoor, Fardeen Khan, Abhishek Bachchan), Haan...Maine Bhi Pyaar Kiya ( Akshay Kumar, Karisma Kapoor, Abhishek Bachchan), Shararat ( Abhishek Bachchan, Hrishitaa Bhatt, Om Puri, Amrish Puri), Bas Itna Sa Khwab Hai ( Abhishek Bachchan, Rani Mukherjee, Jackie Shroff, Sushmita Sen), Dhai Akshar Prem Ke ( Abhishek Bachchan, Aishwarya Rai), Tera Jadoo Chal Gaya ( Abhishek Bachchan, Kirti Reddy, Johnny Lever), Refugee ( Abhishek Bachchan, Kareena Kapoor, Atul Kulkarni, Saif Ali Khan).